David Deubelbeiss has collected all his ESL/EFL/ELL Teacher Training Presentations in one place. Thanks to Judie Haynes, I saw this video, Best TV shows for learners of English. I’m adding it to The Best Popular Movies/TV Shows For ESL/EFL (& How To Use Them). The same people who created this video are creating sixty others related to English-language teaching. It might be worth visiting the video on YouTube and checking out their other ones. TESOL Report: The Changing Role of the ESL Teacher is by Diane Staehr Fenner. Here’s a direct link to the report she writes about. 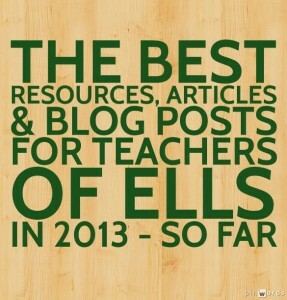 I’m adding it to The Best Resources For Learning About Common Core Standards & English Language Learners. The Common Core State Standards and English Learners: A Resource Page is from TESOL. I’m adding it to the same list. Ideas for English-Language Learners | Celebrating the End of the School Year is my post (co-authored by Katherine Schulten) at The New York Times. I’m sure that this is not the case at our school. However, we are also divided into Small Learning Communities, where 300 students and 20 teachers stay together for multiple years. Do you think this statistic is truly representative of schools generally? Jossey-Bass, the publisher of our book, The ESL/ELL Teacher’s Survival Guide, recently told us that our book has been selected by Walden University for their Canter Read4Credit™ Courses. You can read more about it here. Stemming the Tide of English-Learner Dropouts is an important post from Education Week. Response: Common Core & ELLs — Part Two is the title of one of my posts over at Education Week Teacher. Ideas for English-Language Learners | Earth Day and the Environment is another one of my posts over at The New York Times. I think teachers might find it interesting, and it includes a lesson building on the work of Paulo Freire. Teach-This.com is a new addition to The Best Sites For Free ESL/EFL Hand-Outs & Worksheets. It’s free, and no registration is required to download the materials. Ideas for English Language Learners | The Real Harlem Shake, Mapping Memories and More is a post at The New York Times Learning Network. ELTchat has a new website where transcripts and summaries of all chats are archived. The old site was eltchat.com and the new one is eltchat.org. Links to the old site no longer work. 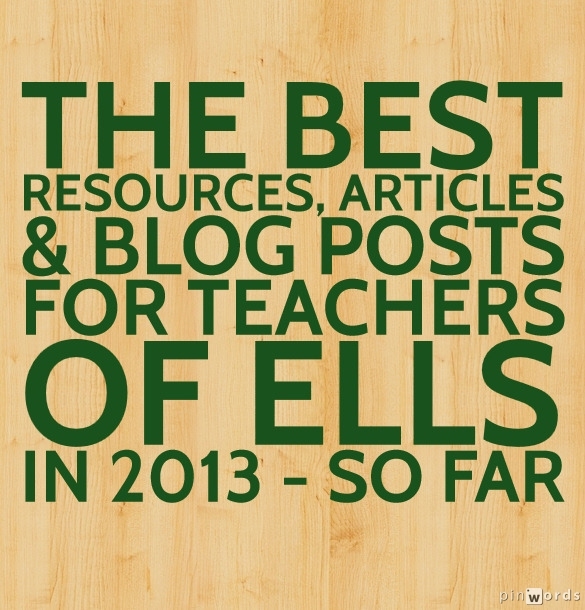 After 31 editions of ESL/EFL/ELL Blog Carnival, it was time for it to be refreshed. So I’ve worked with other bloggers to “re-brand” it as The ELT Blog Carnival and it now has its own permanent site! What’s the “trick” for motivating more L2 in our #ELT classrooms? is by Brad Patterson. Ideas for English Language Learners | Labeling Photos, Sequencing Passages and More is another of my posts over at The New York Times. The ELL Toolbox published Lesson Planning for English Language Learners, which are some useful “cheat sheets” for ELL lesson planning.